Foliage and greenery focused weddings have been a super popular wedding trend the past couple years. Wild and whimsical foliage themed arrangements have been on the rise for both elegant and rustic style weddings, and wedding cakes adorned with greenery are just as trendy. 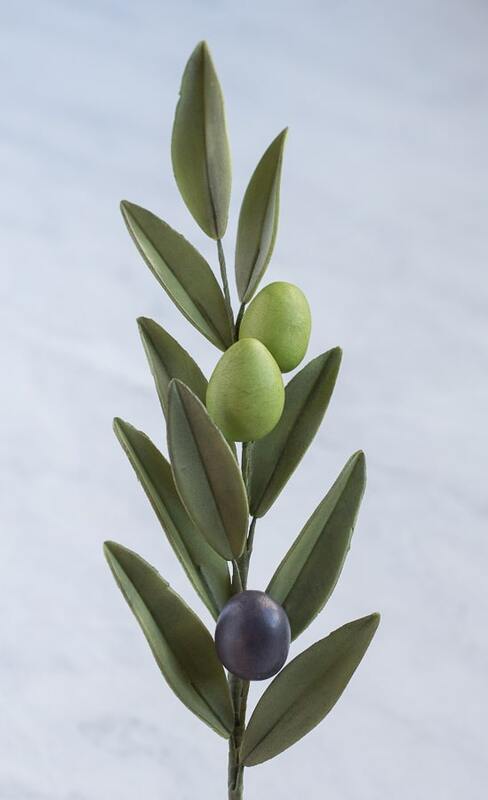 A bridal favorite addition to bouquets, centerpieces and decor is the ever popular olive branches. 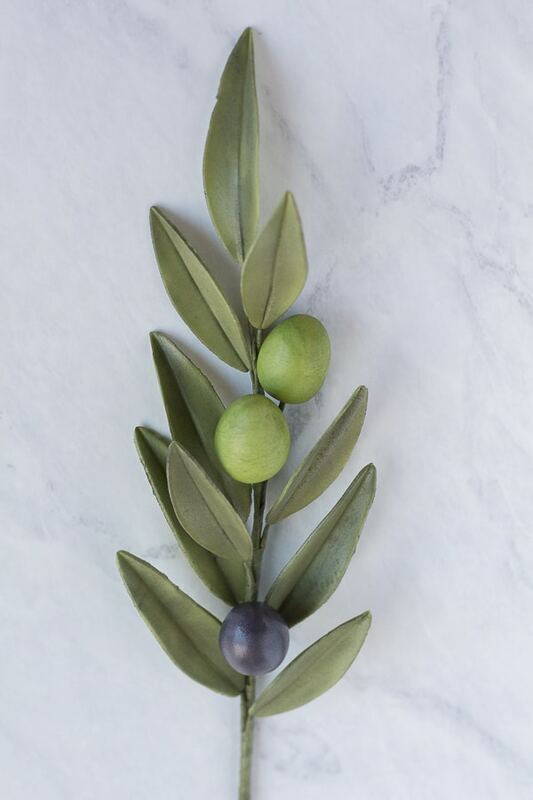 This gum paste olive branch tutorial will have you making quick, easy and beautiful olive branches, perfect for a trendy foliage focused wedding cake and looks great on semi-naked and rustic style cakes. 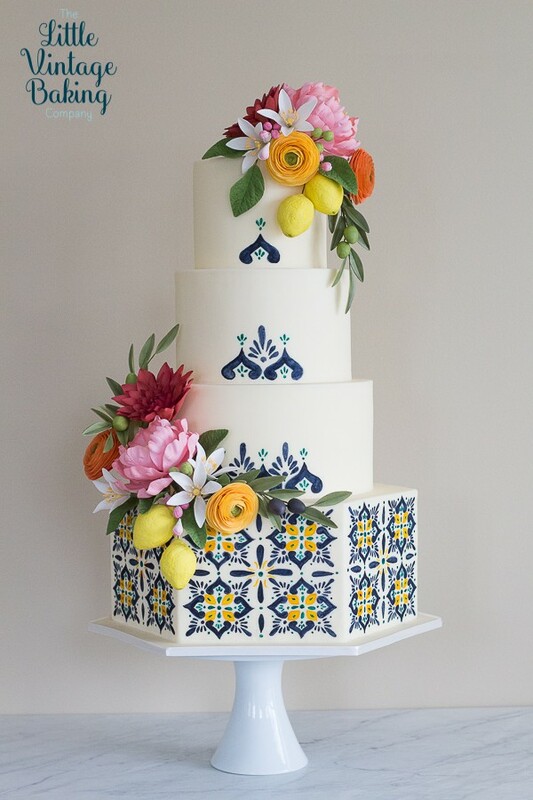 Pair the olive branches with flowers and sculpted sugar citrus for a Mediterranean themed wedding. Or wrap sprigs of olive branches around cake tiers with a gum paste berries and figs for a rustic autumn style cake. Step 1: Roll out moss green gum paste on a non-stick surface. You could also choose to roll out the green paste over the groove of a groove board. I decided not to, as to avoid having a ridge on the backside of the leaf. Step 2: Cut out a leaf shape with the leaf cutters. Using a few different size cutters will make the branch look more realistic. 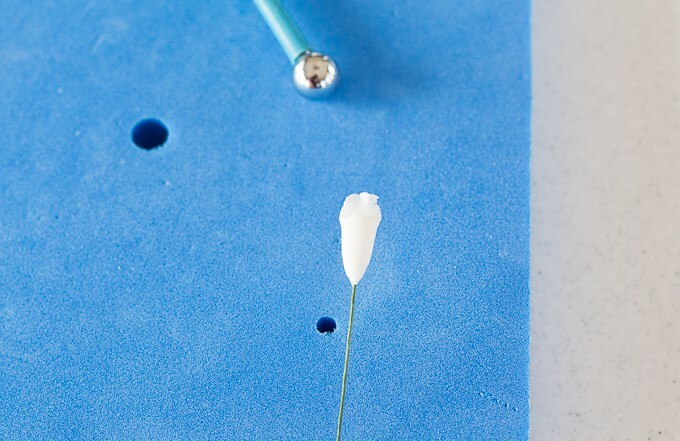 Step 3: Dip the end of a piece of 26-gauge floral wire into sugar glue, wiping off the excess. Holding the leaf between the your pointer finger and thumb, insert the wire into the leaf, about a third of the way in, taking care to not poke the wire through the leaf. Pinch the leaf at the base to fully adhere to the wire. If you used a groove board, insert the wire into the groove and pinch the leaf at the base to adhere to the wire. Smooth out the groove with a ball tool. Step 4: Place the leaf on a firm foam mat. Use a ball tool to thin the edges of the leaf. Do not ruffle. 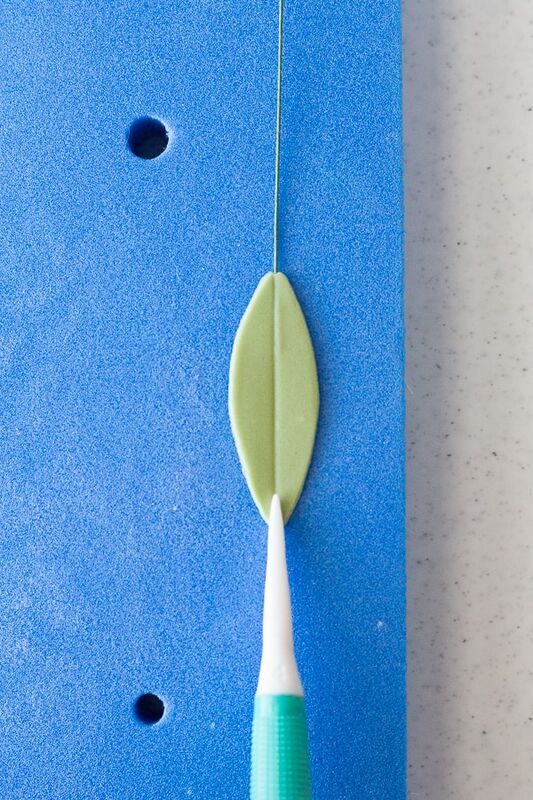 Use the thin side of a Dresden tool to draw a line down the center of the leaf. Step 5: Shape the leaf by folding the leaf slightly in the center. Set the leaf aside on some bumpy foam to dry completely. Step 6: Continue making the remaining leaves for the branch by following the steps above. Step 7: While the leaves are drying, make the olives. Make hook at the end of a piece of 22-gauge wire with the craft pliers. Tear off a piece of moss green gum paste, a bit larger than a marble. Step 8: Firmly roll the paste into an oval shape. Dip the end of the hooked wire in sugar glue, wiping off the excess. Insert the wire into the paste. Set aside in foam to dry completely. Step 9: Repeat the process to make more green olives. Use the purple/black paste to make dark olives. 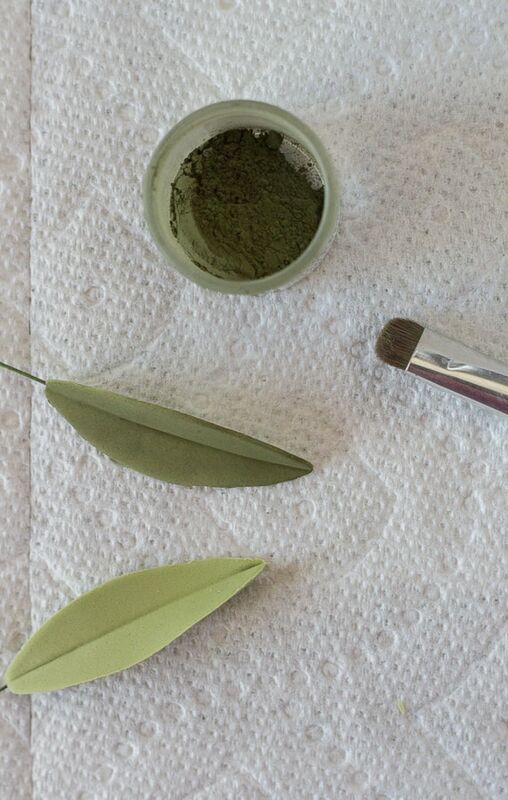 Step 10: Once the olive leaves are dry, dust the leaves liberally with the olive green dust. Do not dust the backsides of the leaves. Step 11: Liberally dust the green olives with moss green petal dust until fully covered. Step 12: Liberally dust the purple olives with charcoal petal dust until fully covered. Step 13: For the pictured olive branch, I used two green olives, one purple olive and ten olive leaves in a variety of sizes. Using the moss green floral tape, tape the wires, about two inches down from the base of the leaves and olives. Step 14: Tape two leaves on either side of another leaf, staggering them to make them look more natural. 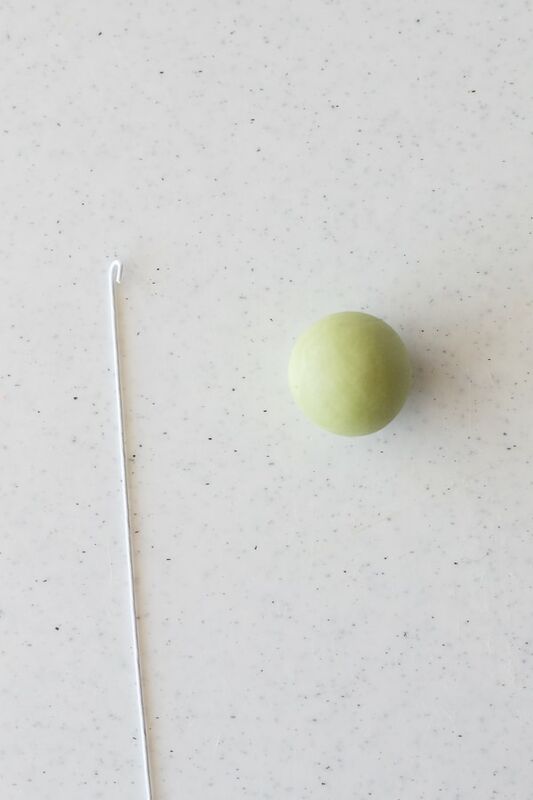 Step 15: Tape on a green olive, then place another a couple inches down. Step 16: Continue to add leaves on either side, staggering them. Place the black olive and continue adding leaves. Once the leaves are all added, continue taping all the way down the stem. 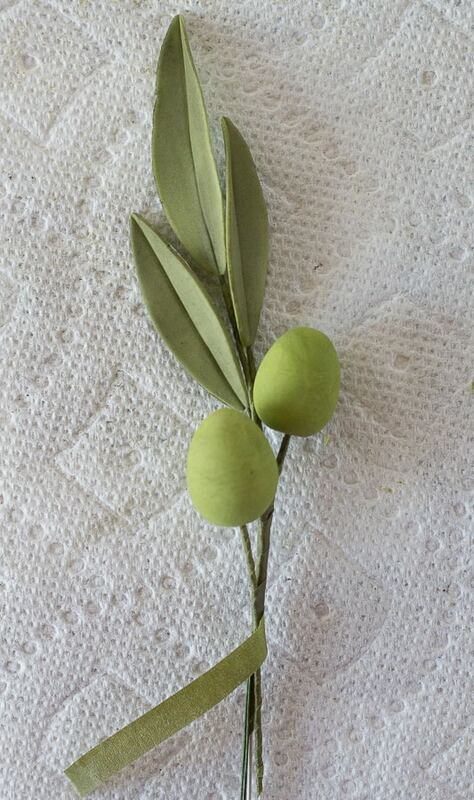 Step 17: Keep in mind that olive leaves are a bit untidy and face all different directions. Adjust the leaves with the pliers to give them a bit more movement and face them in different directions. This will give them a more natural look. I kept mine a bit more straight and organized for learning purposes. Step 18: Steam the branch to set the color. If you wish, you can brush the olives with confectioners glaze to give them a shiny appearance. I chose not to use the glaze for this branch. 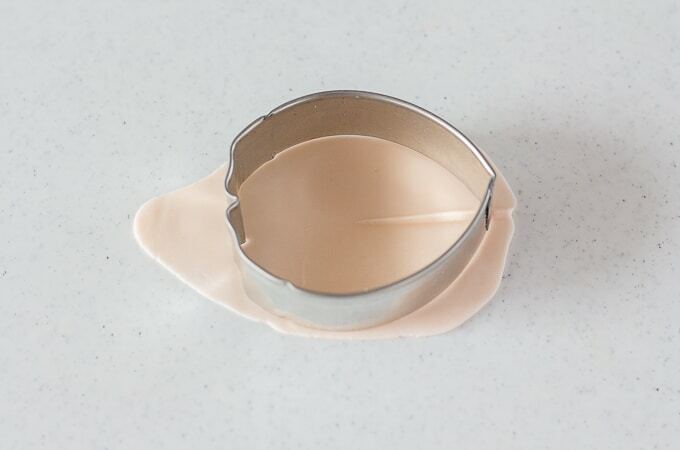 Dry completely before using on your cake. 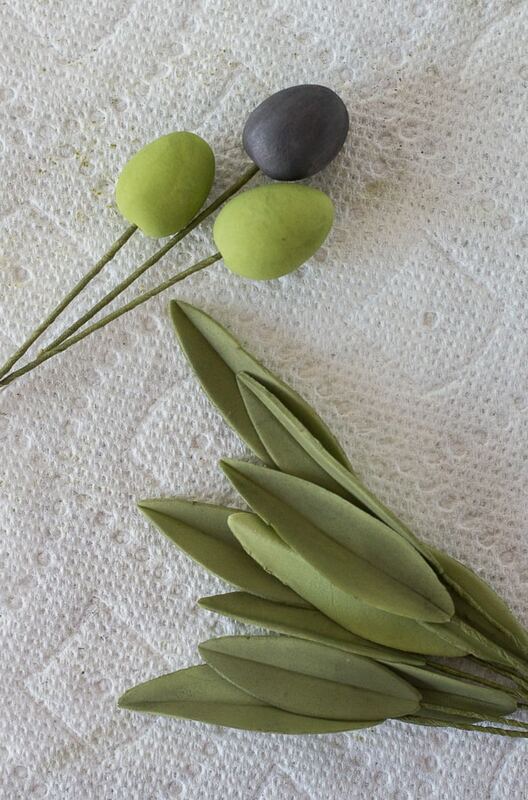 If you make an olive branch using my gum paste olive branch tutorial, let me know! Leave a comment in the comment area below and be sure to snap a photo and tag it #littlevintagebaking on Instagram. I love seeing your Little Vintage Baking creations! Want to know the best supplies needed to make professional style sugar flowers? Check out my post on Essential Tools for Making Sugar Flowers! 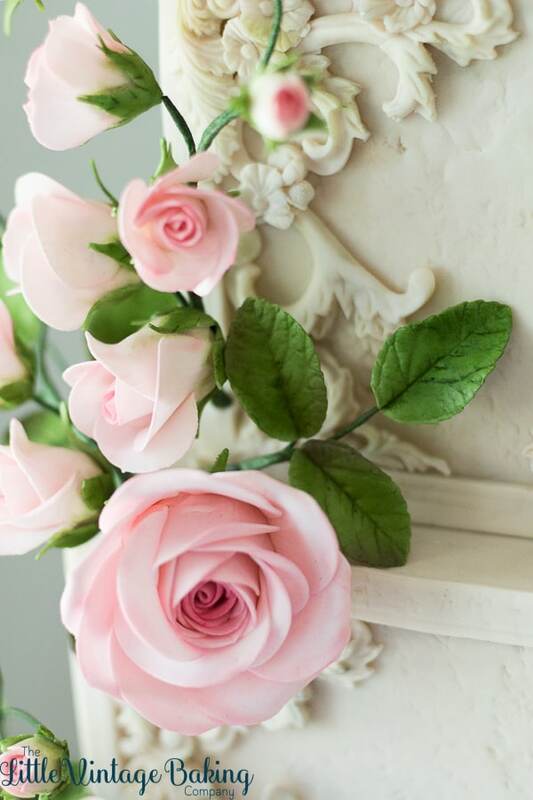 If you’re brand new to making sugar flowers, or if you’re a beginner, it can be overwhelming trying to figure out all the supplies necessary to create gorgeous, professional looking gum paste flowers for your cakes. It’s easy to spend hundreds of dollars on sugar flower supplies just to find that you barely or rarely use a specific product. I’ve compiled a list of essential tools for making sugar flowers, along with my personal recommendations to help you understand better what you’ll need to create beautiful sugar flowers for your cake projects without breaking the bank. I make ALL of my sugar flowers using floral wire and floral tape. I find that this produces the best results, aesthetically as well being the best for stability and mobility. Using floral wire also makes it easier to create arrangements for inserting into cakes. I tend to use both green and white floral wire, but if you were to purchase one color as a beginner, I recommend using white. Sometimes, particularly with light colored flowers, you can see the green wires showing through the paste. Using white wires minimizes this. Keep in mind you will also be covering your wires with green floral tape so no need to worry about the white wire showing. There is a variety of sizes of floral wire. The larger the number of wire, the thinner the wire. I like to use 28, 26, 24 gauge for individual petals and small blossoms, 24 or 22 gauge for leaves and larger style blossoms, 22 or 20 for larger one piece flowers like roses and dahlias. I recommend purchasing a couple different sizes to begin with. I also recommend using paper covered wires over cloth wires, as the cloth can unravel. Over time you will find what size gauges you prefer to use most for your flowers. I will say that gauges mentioned in tutorials, while they’re mentioned for the best results pertaining to that particular tutorial, are not 100% absolutely necessary to make the flower. Making a peony and need 26-gauge floral wire for the petals and your’re out? Use 24 gauge. Just use your best judgement, particularly when it comes to the weight of the flower or leaf you plan on making. Floral tape is used to tape the wired components of your flowers together and create a seamless finish to your flower stem. I use moss green 1/4 width floral tape for all of my flower stems and twig brown 1/4 width to create branches. Floral tape comes mainly in two sizes – 1/2 width and 1/4 width. I always use 1/4 width as this adds less bulk to the stem. If you have 1/2 width, simply cut the tape into two pieces with scissors. Both floral wire and tape can be purchased at cake supply stores and online. PME and Hammersmith are good brands to look for. A firm foam mat is necessary for shaping flowers such as thinning and cupping petals and ruffling edges. I recommend purchasing the firm foam mat with the holes. These holes are used for the “Mexican hat method” of making flowers, which allows you to make flowers with a fluted “stem”. This method is great for making stephanotis, freesia, blossoms and calyx. Some foam mats come as a set of two – one solid foam mat for thinning, and one foam mat with holes. I use this set that is pictured below. However, if you had to choose one, pick the pad with the holes as you can also use this for general thinning and ruffling just as you would the solid white mat. A Celboard is a hard plastic mat that has grooves cut out of it. This board is used to create “veins” in the petals and leaves which allows floral wire to be inserted into. It can also be flipped over to work as a surface to roll out paste and cut out petals and leaves with cutters. I use this board. A variety of modeling tools are necessary for making sugar flowers. A celpin or rolling pin (for rolling out gum paste and thinning petals edges), a ball tool (for thinning petal edges and creating ruffles), and a dresden tool (for scoring buds and texturizing petals). These are just a few must have modeling tools. If you have a cel pin, a ball tool is not totally necessary because you can use the cel pin the same way you use a ball tool. I recommend getting an entire set of good quality modeling tools eventually, but having these specific tools is a good start. Avoid plastic ball tools as they tend to have seams that can rip or tear your paste and they simply don’t last as long. Veiners are used to give flower petals and leaves realistic texture. There are all purpose veiners, flower/leaf specific veiners and veining tools. If you’re just starting making sugar flowers, you can either invest in a couple all purpose veiners or you can purchase veiners specific to what flowers you plan on making for a particular project. 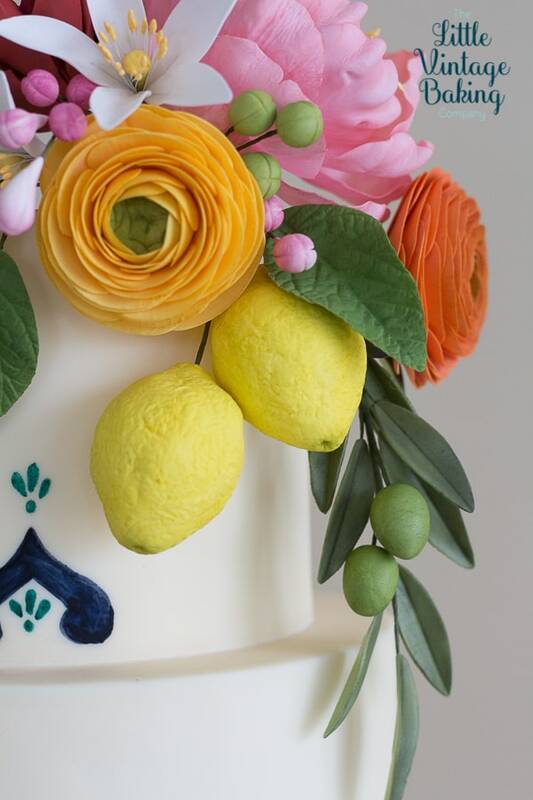 I don’t recommend buying specific veiners unless you plan on making a lot of sugar flowers, plan on making sugar flowers in competitions or you want to ensure your flowers are as realistic as possible. For an all purpose leaf veiner, I use this one. I use this JEM veining/frilling tool for an all purpose petal veiner. Cutters are used to cut out petal and leaf shapes. There’s many, many cutters available for many types of flowers. 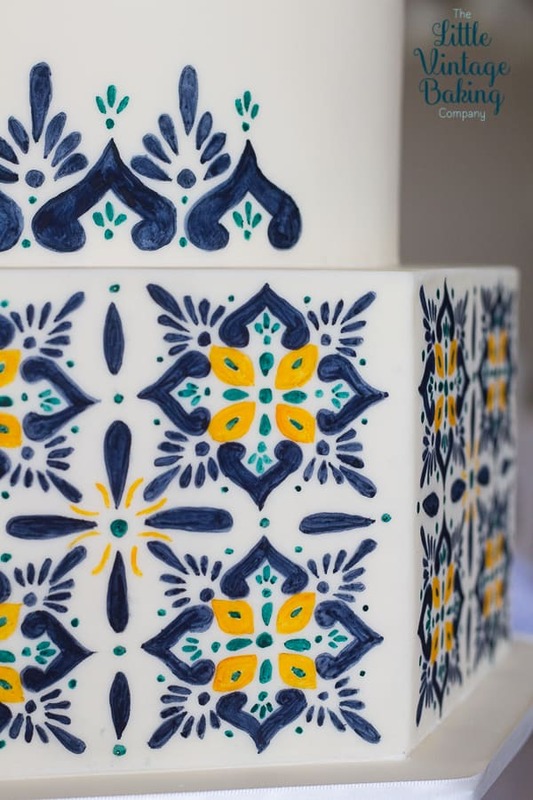 It’s easy to get carried away purchasing all sorts of cutters, but if you’re looking for a few to start with, purchase a few of the most popular flowers that are most frequently asked for on cakes – such as roses, peonies, hydrangea, rose leaves, etc. Keep in mind that a lot of cutters can be multi-functional. Rose cutters (both the individual petal cutters or the 5-petal variety) can be used to create roses, ranunculus and lisianthus. If you haven’t worked with sugar flowers before, most beginners start with roses. Roses can be made without wiring petals and they are very good starter flower. Once you’re ready to try individually wired petals, I would recommend making a peony. Check out my tutorial for an easy, beautiful open peony here. 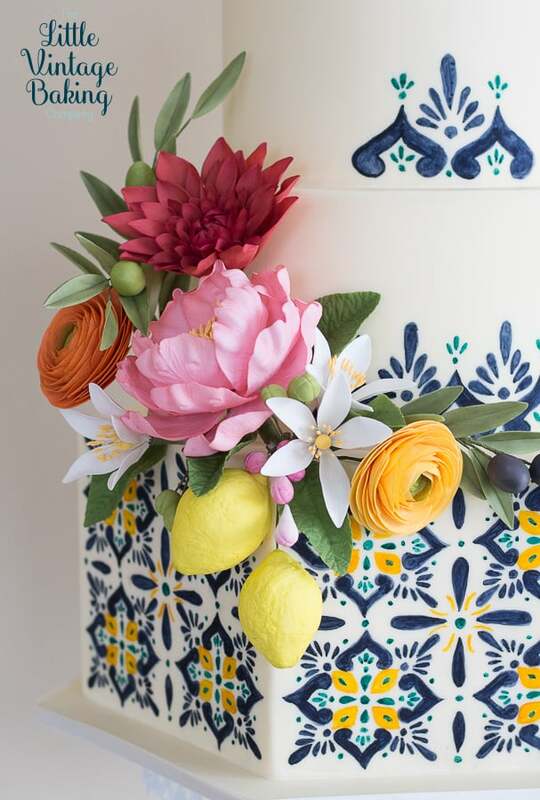 Of course, you will need gum paste to make your flowers. There are many different brands available, and over time you will find which one you like best. Take note of drying times, over all ease of use and also how thin the paste rolls out. You want a paste that rolls out to be super thin and is smooth and easy to work with. Note that all pastes will need to be kneaded with shortening before using for optimal results. To get the most paste for the best cost, I recommend making your own. I find that homemade gum paste is more cost efficient, one of the most higher quality pastes, easy to make and one recipe makes a lot of paste. Check out Nicholas Lodge’s recipe for gum paste here. You will also need vegetable shortening to add moisture, prevent sticking and help with elasticity of your paste as well as cornstarch to dust your surface before rolling out your paste. You can use some cheesecloth to create a pouch filled with cornstarch, you can use a shaker sieve or you can use this one. You will also need an edible glue. You can purchase a sugar glue at the local craft store, make your own by mixing 1/4 cup warm water and marble size ball of gum paste or fondant and letting it dissolve, or you can use egg whites. Petal dusts are used to add additional and detailed color to your flower components. Dusting is my favorite part of the sugar making process because this is when you’re able to really bring those sugar flowers to life. Before making your flowers, you want to make sure that your paste is tinted close to the color you want your final flower to be. There are exceptions for this, like if you needed to achieve an ombre effect, for example. Using a concentrated, quality gel paste will allow you to use minimal color while still being able to achieve bright or dark colors. You want to invest in high quality concentrated dusts. Avoid petal dusts from craft stores as well as the palette dusts as they are chalky and tend to be “watered down” with cornstarch. 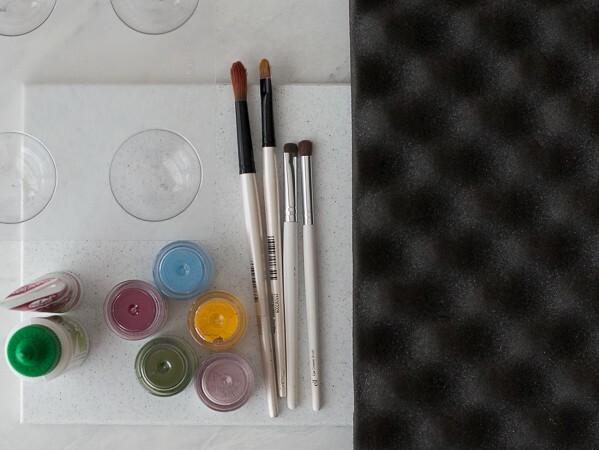 It’s easy to go overboard buying petal dusts, so I recommend purchasing colors over time. It’s a good idea to purchase a couple shades in popular floral colors to start with. You can mix black or white dust with a some of your colors to lighten or darken your dusts a couple shades. Be careful with this technique as it should be done sparingly. The vibrancy of the colors gets lost if you try, for example, to make blush with a bright pink and white dust. Stick with food safe or FDA approved dusts if possible. There are some really amazing brands of dusts out there. Some of my favorite brands are by The Sugar Art and Crystal Colors. You will need a couple different types of brushes for dusting your flowers. To start, I recommend two different style of brushes, both of which are make up brushes. The two smaller brushes on the right are ELF brand and can be found at Target and are quite affordable. I like to use make up brushes and recommend that beginners use them too because they are soft and short bristled and are fairly all purpose. The brush on the far right is more of an all over application brush while the one to the left of it is more for edging and details. Small needle nose jewelry pliers are necessary for being able to bend wires as well as helping insert and adjust flower arrangements in your cake. They act as an extension of your hand, to reach where you can’t, to prevent breaking any of your flowers. 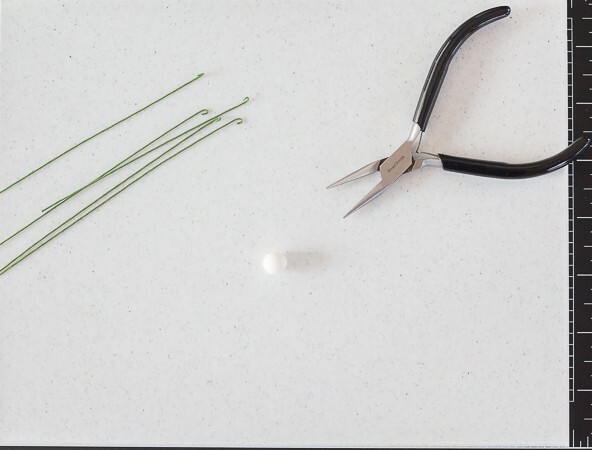 You can use scissors to cut your floral wires but once you’ve created a bulky stem, you’ll need wire cutters. Both small pliers and wire cutters can be found in the jewelry department of your local craft store. 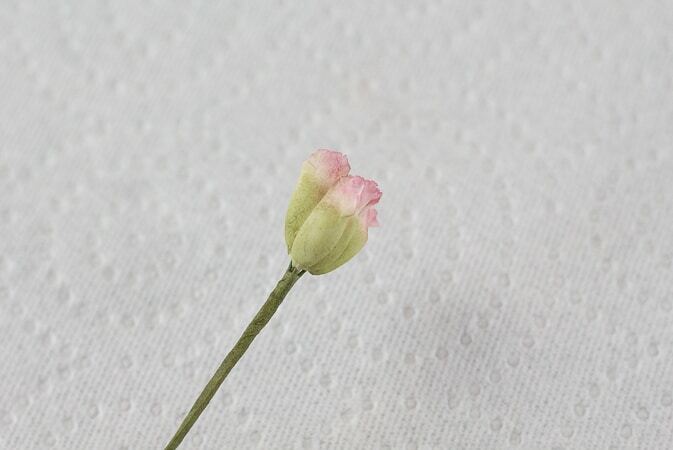 There is a variety of pre-made stamen for sugar flowers available. 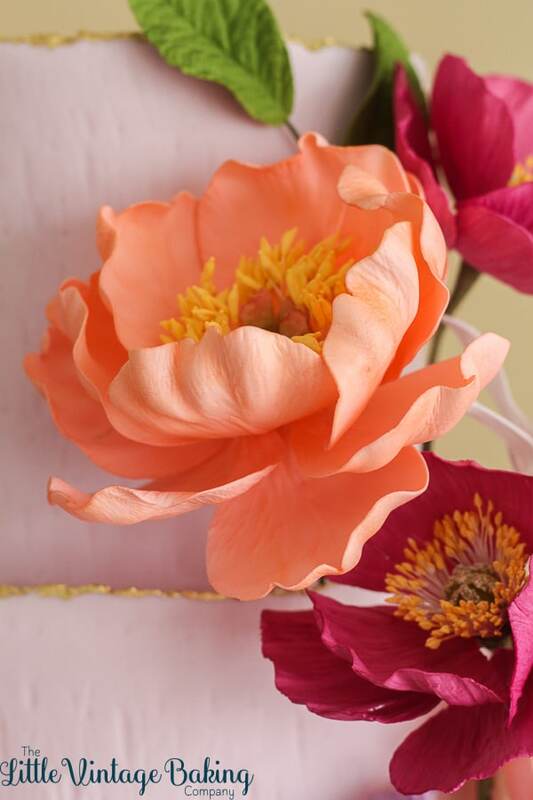 Flowers such as peonies, poppies and anemones require specific stamen for realistic looking flowers. You can make your own – tutorial coming in the future – but purchasing them does save on time. Stamens can be quite costly, especially if you’re making a lot of flowers requiring them so I recommend purchasing them as needed. I order mine from The World of Sugar Art. One of the most important parts of sugar flower making for cakes, is ensuring that your flowers aren’t too heavy for your cake. To help eliminate excess weight, I recommend using foam centers for flowers like roses and ranunculus. You can purchase foam balls at the local craft store and foam rose bud centers online. Flower formers are used to shape and dry leaves and petals. 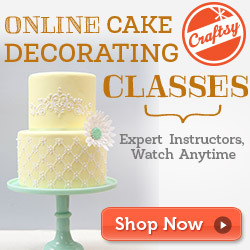 Basic formers include bumpy/egg foam and plastic formers that can be purchased online at cake supplies stores. Formers can be purchased as needed and aren’t totally necessary but I recommend having bumpy/egg foam on hand for shaping leaves and blossom style flowers. Ask someone in the produce department of your local grocery store for a couple of the apple trays that come in boxes of apples. 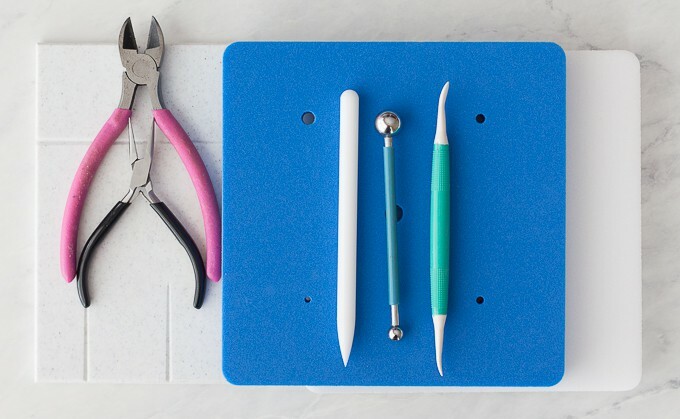 These foam or paper trays are perfect for shaping MANY types of petals. I use it to shape rose, peony, poppy and tulip petals. Most stores will usually give them to you for free. There you have it – a sugar flower essentials list for those of you starting your adventure into the world of sugar flower making. More specific information involving supplies and usage will be found in most tutorials so don’t let this information overwhelm you. 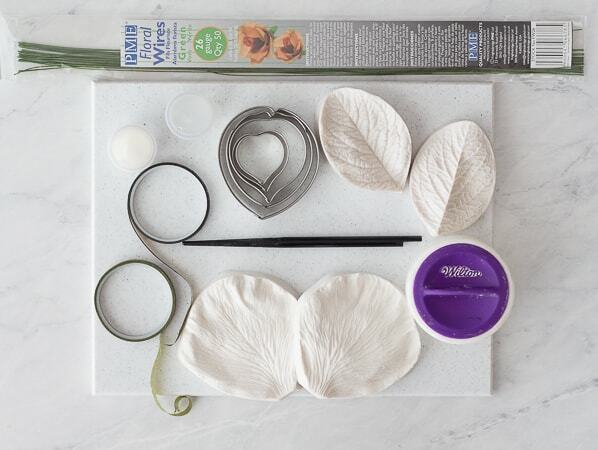 Tackle one flower, one project at a time. As usual, let me know if you have any questions. When you get your supplies and make your first sugar flowers, let me know! Leave a comment in the comment area below and be sure to snap a photo and tag it #littlevintagebaking on Instagram. I can’t wait to see your flower creations! Beautiful and romantic, peonies are no doubt one of the most popular and beloved flowers used for decorating wedding cakes. Their full, lush, ruffle-y shape makes them perfect for gorgeous, over-the-top floral arrangements or even on their own as a focal point statement flower. 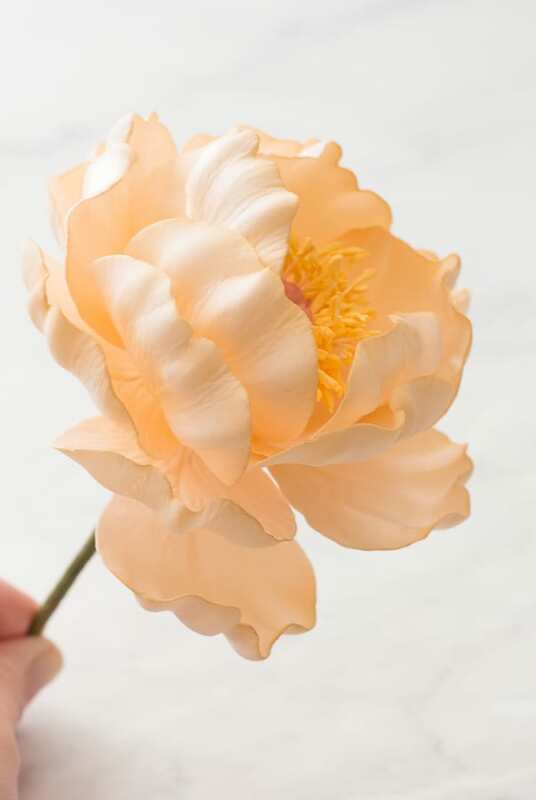 Follow this gum paste peony tutorial and you will be making gorgeous, realistic gum paste peonies for your cakes in no time. 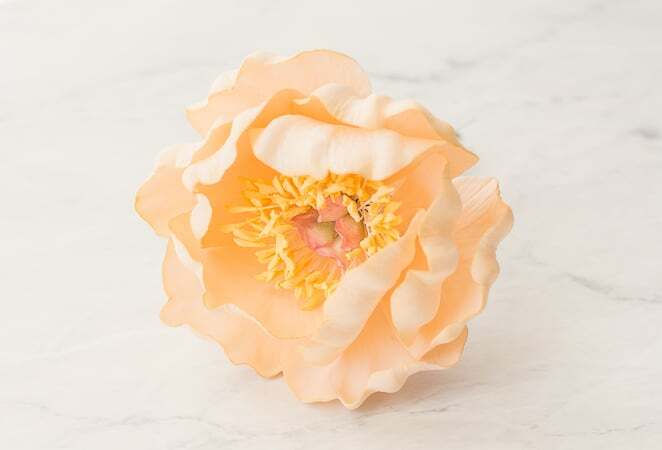 Don’t be afraid to add variety to your gum paste peony. Add more petals to make them more full or leave off a layer of petals for a small, tighter flower. Step 1: Start by making the pistil centers. Using craft pliers, bend the end of the 26-gauge wire pieces, creating a small hook. This hook will help keep the paste attached to the flower. Step 2: Condition the white paste by kneading it with a tiny amount of shortening, warming it, and softening it in your hands until the paste is smooth and workable. Roll a small piece of white paste (4mm, roughly the size of a pearl) into an oblong shape. Seal the remaining white paste in a zip-top bag so that it doesn’t dry out while making your pistil centers. Dip 26-gauge wire into the gum glue, wiping off the excess. Insert the wire into the paste a little more than halfway. Pinch and twist the paste at the base to adhere to the wire. Step 3: Using the tips of your fingers, pinch the tip of the oblong shape to flatten. Using a ball tool, thin and ruffle the edges. Slightly bend the ruffles to give them shape and movement. Step 4: Repeat steps 2 and 3 with 4 additional pieces of paste and floral wire, creating 5 pistils total. Different kinds of peonies have different quantities of pistils so feel free to experiment with more or less pistils. Step 5: While the paste is still pliable, bunch the pistils together to form a tight center. Activate the glue on a length of floral tape by stretching it. Using the floral tape, wrap the wires tightly starting as the very base of the pistils and working downwards. Place pistil center into a piece of foam to dry overnight. Step 6: Dust the pistil center. Using a moss green petal dust, dust the body of the pistil centers. Be sure to dust both the outside and the inside. Then, dust the ruffled tips of the pistils with bright pink. Step 7: Paint the stamen a golden yellow with edible paint. Let dry. Separate the stamen into 4 clusters. Working with 1 cluster at a time, tape each group of stamen to the pistil center about 1/4 inch higher than the center at equal intervals. Fan the stamen out around the center. Set aside to work on the petals. Step 8: Make the peony petals. Roll out purple paste on a groove board as thin as possible. Pick up the paste and flip over, with the groove now face up. Squeeze slightly to give the cutters a more rounded shape. Cut out the petal using the medium cutter, with the groove centered at the base and coming about 2/3 of the way up the petal. Run your finger along the edge of the cutter to allow the petal to release freely and to remove any stray bits. Step 9: Dip the end of a piece of 26-gauge wire in gum glue. Wipe off the excess. Insert the wire into the groove, about 1/2 way up the petal, taking care to not stick the wire through the front of the petal. Pinch at the base to adhere the paste to the wire. Step 10: Place the petal into the veiner and press down to vein the petal. If you are worried about the paste sticking, dust the veiner lightly with cornstarch before veining your petals. Step 11: Place the petal onto a dense foam mat. Using a ball tool, thin the edges of the petal. From the edges of the petal towards the base, cup sections of the petal using the smaller ball of the ball tool, about 4-6 times per petal. Don’t worry if some of the petal edges tear. This adds more realism to your peony. Note that your petals do not all have to look the same or consistent. Make each one a bit different to make them more realistic. Step 13: Repeat steps 8-12 to create 16 petals total. Step 14: Once the petals are completely dry, dust with petal dust. 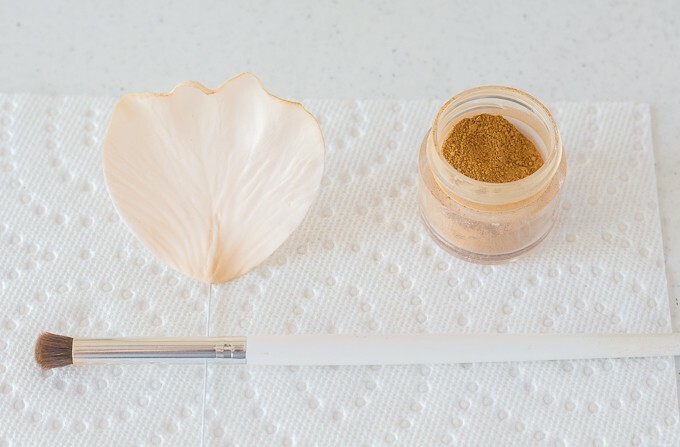 Brush the edges and the base of the petals lightly with the sepia dust. Be sure to brush the backsides, as well. Step 15: To assemble the flower, begin with 5 petals size petals. Gently angle the petals back, so that the petal will cup around the center and the petal wire aligns with the center wires. Wrap 2-3 petals at a time, tightly, with floral tape, placing each subsequent petal over the previous petal. Adjust the petals so that they evenly cup around the center. Step 16: Add 6 additional petals for the second row. Gently angle the petals back so that the petal will cup around the first layer of petals and the petal wire aligns with the center wires. Wrap 2-3 petals at a time, tightly, with floral tape, placing each subsequent petal over the previous petal and in between the first layer of petals. Adjust the petals so that they are evenly spaced around the first set of petals. Step 17: Add the last row of petals. Repeat step 16 with the 5 remaining large petals. Step 18: Move the petals around to open and close them depending how tight or how open you want your open peony to be. I like to open my last row of petals out more to make my peony look fuller and bloomed. 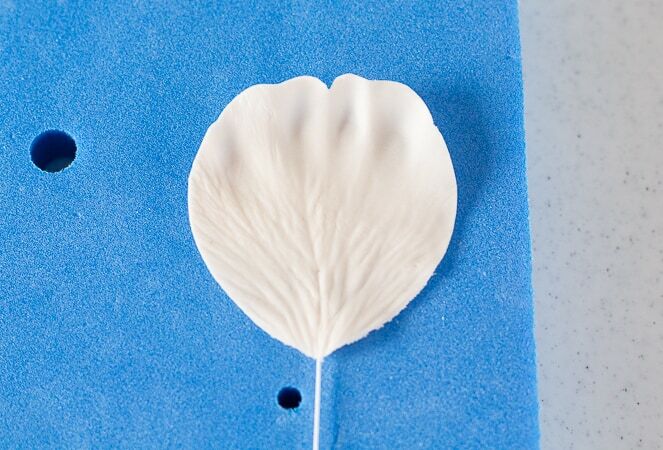 Step 19: Steam your petals for 3-4 seconds to set the color and eliminate the dusty look. You can use a steamer if you have one. I use a tea kettle. You can also use a saucepan. Boil water until steaming. Carefully wave your flower through the steam. Be careful to keep your fingers out of the way as the steam is hot and cause severe burns. Set the open peony into a foam dummy to dry completely. 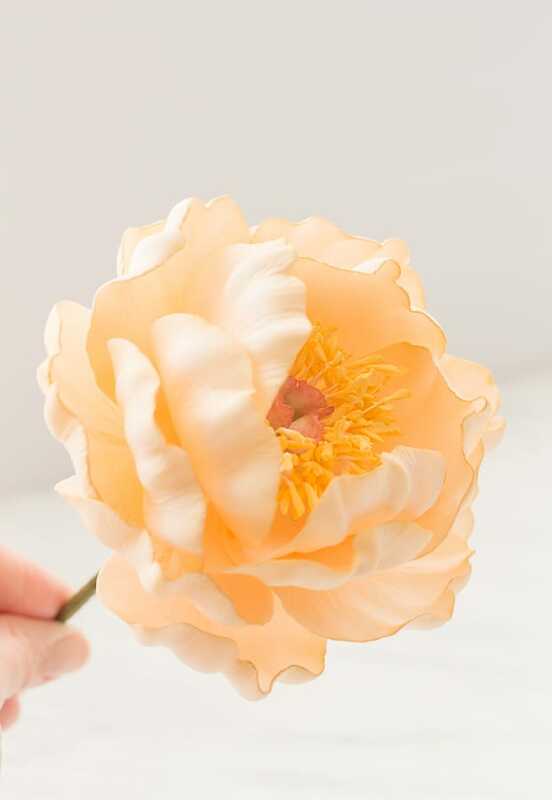 If you make a peony using my gum paste peony tutorial, let me know! Leave a comment in the comment area below and be sure to snap a photo and tag it #littlevintagebaking on Instagram. I love seeing your Little Vintage Baking creations!